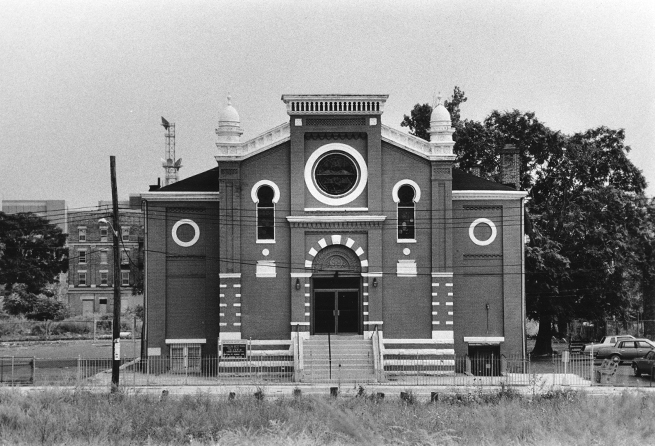 Today, we continue our series of articles on Newark’s African-American history, starting with a look at one of the city’s most well-known churches in the black community before moving on to some of the people who made their mark on the city in this century. Pansy Borders was part of Newark’s emerging black middle class of the 1950s through 1970s. Her contributions were in the field of education in general and social work in particular. The daughter of Rev. and Mrs. H. T. Borders of Hopewell Baptist Church, who came from Buxton, Iowa, received her first college degree from Howard University and an M.A. from Teachers College, Columbia. She later taught in Florida and South Carolina. In an interview in later years, she noted that African-Americans usually had to teach outside the Newark system before being accepted into the Newark system. She taught first in Newark at Maple Avenue School, where she was the first black employed. At the time, there were only seven African-Americans in the whole system. Her adviser and champion was Dr. Bruce Robinson, with whom she worked for many years. At West Kinney School, she established parent/teacher discussion groups. Before that, she coordinated a school program where 'no member of the community was made to feel unimportant.' Her main desire was to infuse social work into the school curriculum. To accomplish this task, five social workers were assigned to her. According to a 1949 news report, Borders spent a summer studying at the State Reformatory for Women at Skowhegan, Maine, where she tested inmates and reviewed their case histories. The statistics she compiled showed that almost three-quarters had not gone beyond the seventh grade. She found this information particularly interesting and applicable to the situation being faced in Newark. In the late 1960s she taught at a teacher training institute and attended a conference on contracts chaired by Richard Nixon, who was then vice president. In 1967, after 31 years of service in her field, she was named 'Social Worker of the Year.' 'I’m as excited as can be because they selected a school social worker,' she said, noting that this added to the award’s significance. Oliver Willis 'Butts' Brown, editor of the Herald-Advance, a weekly for blacks, was born in 1900 and died in November 1966 at the age of 66 after an illness of several months. He was born in Flemington and lived in Camden and Trenton before moving to Newark, where he lived for 37 years. Brown graduated from Lincoln University in Pennsylvania, where his roommate was the poet Langston Hughes, and attended the New Jersey Law School in Newark. He was a member of Bethany Lodge, F & A M, Prince Hall masons and a past president of the Frontiers International in Newark. He was a supporter of the Boy Scouts and Alpha Phi Alpha fraternity, among other associations. Brown had become editor of the Herald-Advance, which appeared after the merger of the New Jersey Herald News and The Advance, only months before his death. He began working for the Herald News on the sports desk and became the paper’s editor in 1947. An avid sports fan, he served in public relations for the Newark Eagles professional baseball team, a team that produced major leaguers Larry Doby, Monte Irvin and Don Newcomble. He subsequently became a secretary of the old Newark Dodgers. What a font of information Oliver Willis 'Butts' Brown would be as a source of African-American history if he were only alive today. Bessie Lanier Smith of 61 Hillside Ave. in the Clinton Hill section of Newark, died of a heart attack at 42 just hours after attending a meeting of the United Community Corporation at which she had been elected treasurer. She was born in Virginia, but spent most of her life here in Newark, graduating from Arts High School. Smith’s contribution to Newark in the 1960s could be found in her demand for a greater voice for the people in the UCC’s activities, especially for the poor. Not enough power was being passed on down to the people, she believed, a premise that frequently resulted in verbal confrontations. Her tenacity in fighting for the people’s rights was acknowledged by then-Mayor Hugh J. Addonizio, who sometimes disagreed with Mrs. Smith but credited her for demonstrating 'true community leadership by helping many persons participate in city affairs who had never taken part before.' Rabbi Jonathan J. Prinz called Mrs. Smith a 'devoted and energetic community leader and a pioneer in the (Newark) war on poverty.' Bessie Lanier Smith left behind not only a son of 5, a daughter of 9, and two Newark brothers but also a fighting spirit. Rev. B. F. Johnson Sr.
Rev. B. F. (Benjamin Franklin) Johnson Sr., for many years dean of Newark’s black ministers, was born in Virginia in 1896 and died at 95 in 1992 at Newark’s Beth Israel Medical Center. Not only was he a backbone of Metropolitan Baptist Church, he was also one of the founding fathers of the Committee of Black Churchmen, which came into existence after the 1967 riots. The Rev. Bernard Wilkes, also of Metropolitan Baptist Church, called Rev. Johnson 'the dean of ministers, in part because he directly mentored more than 50 other black ministers, and affected the growth of hundreds of other ministers.' Wilkes also credited Johnson with an involvement in the formative years of the Southern Christian Leadership Conference, for it was Johnson who helped arrange for Dr. Martin Luther King’s visit to Newark in 1968. Born in rural Virginia as one of 11 children, Johnson was the grandson of a slave who preached the gospel to other slaves at the risk of whippings and death threats. He attended Hampton Institute and was his class valedictorian at Virginia Seminary. Later, he became a public school teacher, and served as pastor in a church in Goldsboro, N. C. He also was chairman of the Home Mission Board of the National Baptist Convention, a member of the North Jersey District Association of Baptist Churches, and was also former president of the New England Baptist Convention. At a time when most would had passed into retirement, Rev. Johnson took on the construction in the 1990s of a huge new church building at 149 Springfield Ave., adjoining the Society Hill housing development. But he did not live to see its dedication. Under his guidance, Metropolitan’s congregation grew from a few hundred to more than 3,000 members, many of them Newark residents. Today the new church stands as a dream fulfilled, boasting a sanctuary seating 1,200, a 500-seat banquet hall, a Sunday school and Christian education class rooms for 300. The building also includes a gymnasium, commercial kitchen and small chapel. 'While his pastorate probably stands among the longest in the Newark area, there is no question as to the impact Rev. Johnson has made upon the city and the Baptist churches,' New Jersey Afro-American editor Robert Queen, once wrote. At Johnson’s funeral service, Dr. Edward W. Verner, president of the Newark North Jersey Committee of Black Churchmen, praised him as 'one of the greatest pastors in our time.' Mayor Sharpe James referred to him as 'a tower of strength who helped thousands of people.' Rev. Paul Stagg said, 'We have lost a great leader and the dean of the ministers.' For 48 years of service to Metropolitan Baptist Church, for his part in the civil rights movement, and for helping Newarkers of all backgrounds, the Rev. B. F. Johnson Sr. has earned a prominent place in Newark’s recent history. Timothy Still, president of Newark’s United Community Corporation, the city’s anti-poverty agency, died at 48 in 1968 after having just been re-elected to a second four-year term as the agency’s chief executive officer. Still was born into a poor Alabama family, grew up in poverty, quit school during the Depression, boxed in pool halls for money, and worked as a garbage collector and a porter in a brewery. Later, he was to act as home secretary for Rep. Joseph G. Minish of the 11th Congressional District and as a consultant to the Newark Housing Authority. In 1941, he was Golden Gloves heavyweight champion, and for more than 20 years was active in youth, tenant and political groups in the Central Ward where he was considered a political moderate. Most important, he was considered an articulate communicator who was known for his integrity in dealing with all people. After dropping out of school in the 8th grade because of his trouble with reading and taunts from other students, he joined the Civilian Conservation Corps, earning $5 monthly for himself and $15 for his parents. At 17 he took up boxing, hoping to make his name and fortune. He served in the Second World War and was discharged in 1945. Again, he took up boxing but soon went to work for the Newark Sanitation Department. As president of the United Community Corporation, he succeeded Dean C. Willard Heckel of Rutgers Law School. In a 1967 article the Newark News described him as 'moderate and conservative' as he took the reins of an agency with a $4 million annual budget and 12 active programs. Upon winning the election, Still said, 'I’m no miracle worker, but I’ll do all that I can. If I thought it was going down in wreckage, I wouldn’t have taken the job.' Still’s administrative talents and political skills, combined with his ability to deal with people with moderation, soon made him a name throughout the city and beyond. Apparently his hard upbringing not only had acclimated him to the reality of the streets, it also had helped his understanding of people’s insecurities and personal problems. In 1968, Still, United Nations Secretary General U Thant and Secretary of the Interior Stewart L. Udall received honorary doctorate degrees of Humane Letters at Rutgers 202th commencement. At the time, Dr. Mason Gross, the popular president of Rutgers, noted that Still 'grew up in the ghetto.' Furthermore, Gross said, 'Still is an outstanding citizen of Newark with that rare ability to bring men and women together to work toward the solution of problems of poverty, race and domestic peace.' Still’s premature death ended a career of an unusual and talented man. City employees were sent home from work early, a memorial service was held at City Hall, the Municipal Council declared a week of mourning, and flags were flown at half staff. Still laid in state at the Fuld Neighborhood House until his funeral, presided over by the Rev. B. F. Johnson of the Metropolitan Baptist Church. Hundreds of people attended. Newspaperwoman Connie Woodruff, a veteran political analyst, noted, 'Tim was an outstanding example of the kind of leadership Newark is capable of producing. He successfully negotiated with City Hall without losing his identity as a community activist.' A year later a simple memorial service marked the anniversary of Still’s death. The service was presided over by Dr. L. Sylvester Odom, then UCC president. The ceremony also marked the opening of the Tim Still Camp at East Stroudsburg, Pa., where 700 young campers were expected to enjoy a summer away from the big city. Apparently, the old Still magic was continuing to work for the children of the Central Ward.